This Mini Sumo Wrestler is an easy Japanese Craft for kids to make with our printable template to color! His legs and arms are made from a bendable pipe cleaners; make 2 and have your own sumo wrestling match! Younger children will need an adults help to put in the arms and legs! 1. Color and cut our your wrestler. 2. Using a craft knife or scissors cut the four slits along the dotted line on the front of your wrestler. Fold your pipe cleaner in half and insert it into the slit on one side out the opposite side. Repeat with the other pipe cleaner on the other side. Your pipe cleaners will be cris-crossed in the middle. 3. Fold your pipe cleaners into arms and legs. 4. Glue the on the back of your wrestler. 5. Cut a small triangle from a piece of Kleenex or tissue paper. 6. 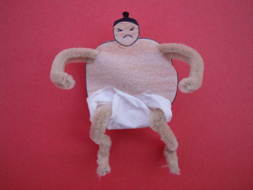 Make your Sumo Wrestler's Mawashi by gluing the triangle around his body and up through his legs.